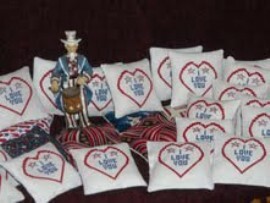 77 kissing pillows were made in record time for National Guard members! Several items were donated to the women's shelter. 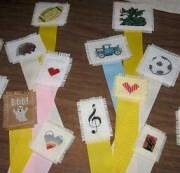 Many lovely bookmarks were stitched. 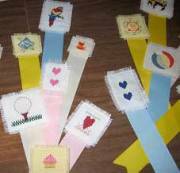 A teen group at the Grabill Public Library were taught to make bookmarks, name tags and pins. All materials were donated by members or paid for from their treasury. Kissing Pillows for members of the military deployed overseas and their families were stitched as part of an ongoing project. 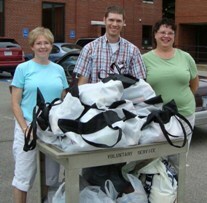 Susan Sobota, Jayson Bower, and Debbie Schultz delivered gift bags for the patients at Ann Arbor's VA hospital in July 2010. 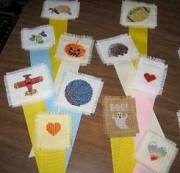 Members stitched Bookmarks as part of EGA's Literacy Outreach project. These were donated to the Yellow Springs Library. 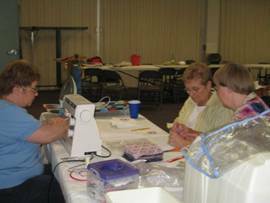 Their local library provided space for them to set up a needlework display. They hosted Camp Quality 2010. 50 Kissing Pillow tops were made and sent to the Arizona guild to be assembled. 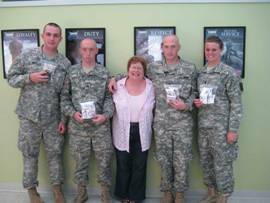 836 needlework kits were collected and sent to Brooks Army Medical Center. 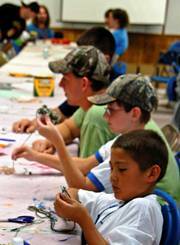 Members entered the 2010 DuPage County Fair. A total of 206 knitted baby hats were made for the newborns at Covenant Healthcare. These were turned in monthly. Members made four Habitat for Humanity samplers and presented them at each homes' dedication.